We can supply warehouse uniforms for people who work as workhouse operatives including pickers, handlers or unloaders. There’s no doubting anyone who works in a warehouse has to be fit. Workwear has to allow for bending, lifting and stretching so should be comfortable. In fact the demands of these roles are similar to roles in the health and social care sectors where we design uniforms for a wide range of staff. We design and make all our garments in the UK and our workwear is available to individuals as well as businesses and organisations. There’s no minimum order and orders placed before 3pm are despatched the same day. Any piece of clothing can be embroidered to include a name or logo by our in house embroidery service. You’ll also find our in-house customer service team friendly and knowledgeable should you have any queries. Clothes that offer layering opportunities are ideal for a warehouse environment and our garments allow for flexible dressing. Our ranges include bodywarmers, fleeces, polo shirts, t-shirts, sweat shirts, hoodies and soft shells. All are designed and made to be practical, hard wearing and easy to care for. Just what people need for frequently worn work garments. 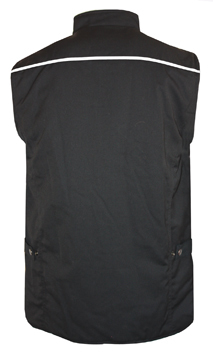 Our Gryzko Bodywarmer is perfect for wearing over t-shirts, sweatshirts and polo shirts. It features 3M reflective tape and twin stitching for extra durability. Made from our own hard wearing cotton polyester blend it’s available in black and in sizes S to XXL in a Regular fit. Fleeces are available in different qualities. Our standard Unisex Fleece is available in sizes S to XXXL and in Navy Blue or Black. Features include a full length zip with an adjustable shockcord hem, stand collar, fleece cuffs and 2 lower pockets. Alternatively we have the Premium Unisex Unlined or Lined Fleeces. These are also compatible with our Unisex Interactive Waterproof Anorak as the two garments can be zipped together. Both premium fleeces feature an internal pocket and two side- zipped pockets and are available in sizes S to XXL. We also design 4 different polo shirts which are available in a wide range of self or contrast colours. These include our Premium Quality Polo Shirt, Industrially Launderable Polo Shirt and 2 different Gryzko Polo Shirts. All are available in sizes S to XXL with a choice of colour, are generously sized and have more features than you’d expect. Our Sweatshirt is available in 6 different colours and in sizes S to XXL. Made from a 300gsm poly cotton blend it features a brushed inner face for extra warmth. The Gryzko T-Shirt is available in 9 colours and is made from a heavyweight 195gsm poly/cotton. It also features a taped neck and shoulder seams for extra strength. The Gryzko Hoody offers the benefits of a sweatshirt with a hood. It also has a Gryzko heavy duty full front zip and two side pockets with a brushed inner face, and elasticated hem and reinforced neck seam. Various waterproof garments are also available. Right now we have special offers on some of our polo shirts including 25% off a pack of 5 premium quality polo shirts. It’s possible to mix and match sizes and colours. Offers change all the time so check back often!